The Naxos/Hong Kong Philharmonic here reaches its climax, with a Götterdämmerung that is easily the equal of any of the previous installments. The overall success of this project is great news for the orchestra, who play magnificently here, and for their conductor, Jaap van Zweden, although he doesn’t want for prestige now, given that he was appointed Music Director of the New York Philharmonic mid-way through the project. It is great news for Naxos too, whose otherwise encyclopedic opera catalog has so far been short on Wagner. The label has also used the cycle to trail their Blu-ray audio technology, which comes out on fine form here, offering surround sound that is a model of clarity and warmth. Jaap van Zweden is a dynamic Wagnerian, but he doesn’t take the driven, up-tempo approach of many of his contemporaries. His reading is well-paced, sometimes relaxed, but always alert. His slower tempos offer breadth, but, good as the Hong Kong orchestra is, it doesn’t produce the sort of luscious textures he can wallow in, so Zweden always maintains a sense of pulse and line. He is particularly alert to the score’s changes of tempo and mood: an atmospheric scene opening, such as at the start of act II, will suddenly transform into a dynamic dialogue, the continuity maintained, but the new tempo firmly established. That combination of expansive but agile serves Zweden and his orchestra well in all the set pieces as well—Rheinfahrt, Funeral Music, Immolation—but all feel well integrated into the drama too. The precision of the orchestral playing is impressive. The recording is drawn from two live performances, but that’s not usually enough to get all the horn calls at the opening of act III without splits: The passage is perfectly rendered here. One or two tiny slips in the string ensemble in fast passages is the only technical problem to note, and perhaps a lack of control on some of the accented lower brass entries. The cast includes a few big names—Michelle De Young, Eric Halfvarson—but unfortunately not in the lead roles. And there is one disappointment here, Daniel Brenna, who makes for an uninspiring Siegfried. He has all the notes, and the power too, but his articulation is imprecise, and he occasionally swoops up to top notes, or launches into them in a very labored way. No such complaints about Gun-Brit Barkmin, as Brünnhilde. She has a narrower tone that some of her famous predecessors, but she compensates with a lyrical and precise delivery, wonderfully dramatic and expressive. Having a native German speaker in this role is a benefit too, especially one with such clear diction. Eric Halfvarson was a last-minute substitute for Mikhail Petrenko in the role of Hagen. His voice is too deep really, much deeper than that of Peter Kálman as Alberich, which makes a nonsense of act II, scene 1. But his “Hoiho”s in act III are suitably strident. Gunter and Gutrune are well represented by Shenyang and Amanda Majeski. Shenyang has a clear, projecting tone, although he too sounds a little too low for the role. Majeski sings with heavy vibrato, and exaggeratedly rolled “r”s, but she delivers a convincing and emotionally engaging reading. Michelle de Young returns to the Hong Kong Ring, having sung Fricka in Die Walküre. Her amber-toned mezzo makes for luxury casting in the role of Waltraute—too bad it is over so soon. A huge chorus is assembled, made up of the Bamberg Symphony Chorus, Latvian State Choir, and Hong Kong Philharmonic Chorus, and despite the size, their singing is well disciplined, as is their whispering at “Was ist?” in act III, a magical moment. The chorus sounds distant in the surround-sound environment, but otherwise the audio is very engaging. The soloists are all grouped in the center channel, but the orchestra spreads around them across the speakers. The percussion come across particularly well, especially the timpani. And the lower end of the orchestra is well represented, though without the lower brass dominating. 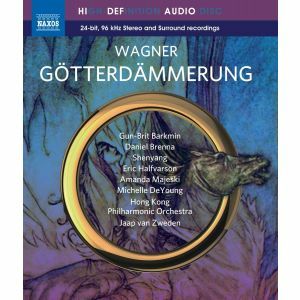 A box-set of the Hong Kong Ring cycle is being released to coincide with this Götterdämmerung, and it should be an attractive proposition, especially at Naxos prices. The less than stellar casts in each of the installments will likely deter some, although it is difficult to think of any significantly better cast versions in modern audio. With that proviso noted, the conducting of Jaap van Zweden, the playing of the Hong Kong Philharmonic, and the excellent audio (engineer Phil Rowlands) all count in the project’s favor. I was particularly impressed by the audio on this last installment, but there is no doubt that it is a major selling point for the entire cycle. This review appears in Fanfare magazine, issue 42:4.